Maria Emmerich is a wellness expert in nutrition and exercise physiology. I came across her lovely blog that incorporates healthy eating, recipes and much about Keto eating ( a less mainstream low carb, high fat diet). What I was interested in was information about coconut flour, a product I had bought and experimented with, without really understanding what health benefits it could offer. When baking and cooking with new flours there are a range of issues, as each flour absorbs different amounts of liquid and the number of eggs required in a cake for example may vary. 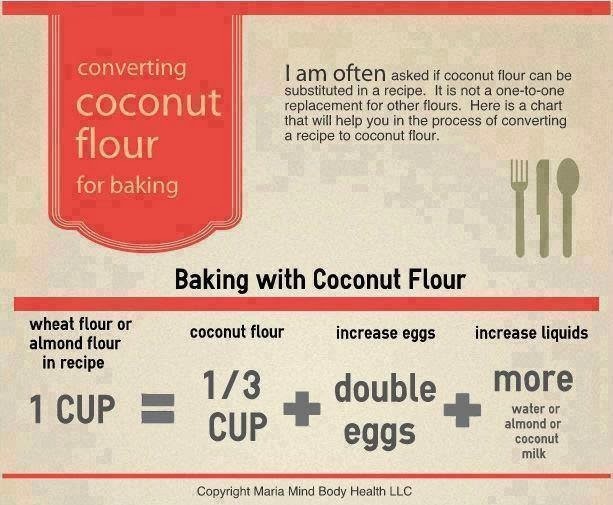 I found her chart on converting coconut flour for baking helpful. I have enjoyed what I have made so far, but it is not a ‘cheap’ product so I am using it carefully until I am confident of how it will benefit the family. Have you cooked with coconut flour before? Do share your experiences in the comment section.